Create special moments with this Signature Fresh Fruits and Floral Arrangements Basket when you are together with your loved ones. 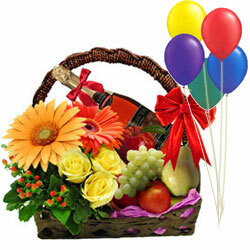 Everything goes well with this auspicious Basket of treats as it arrive with 10 Mixed Flowers, Apple (Net Content- 1/2 Kg. ), Pears (Net Content- 1/2 Kg. ), Grapes (Net Content- 1/2 Kg. ), 3 Balloons and 1 Bottle of Sparkling Fruit Juice. Note: Brand of the Sparkling Fruit Juice may differ depending on the availability in the city of delivery.